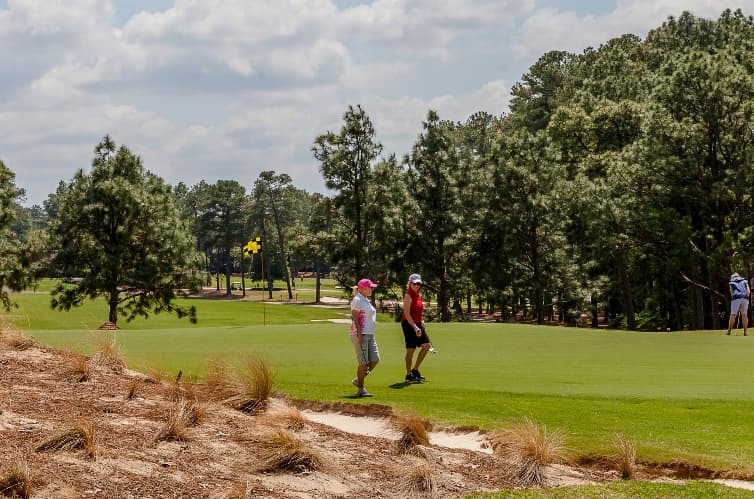 If you’re checking Pinehurst off your bucket list this year, you’ve probably already scoured the Internet in search of secrets to make your trip a memorable experience. But we know the best advice is passed down from friend to friend, so we asked our friends (OK, OK, they are technically former guests) to tell us what tips they would give a newbie. They took to Twitter and Facebook to share their best advice, which we have compiled below. First, let us share a few tidbits from our staff. Have a drink in the Deuce: It’s Pinehurst’s newest tavern, it opens out to the veranda overlooking 18, and if you look around a bit, you’ll find the sleeves Payne Stewart cut off his jacket – and the scissors he used – from the final round of the 1999 U.S. Open. Pose for a photo with Putter Boy: The bronze statuette is the symbol most synonymous with Pinehurst, so be sure to get a shot with him. Take advantage of our FREE shuttles: Park your car and leave it there until it’s time to leave. We offer complimentary shuttle service to all Resort facilities and the Village of Pinehurst during regular operating hours. Click here for more information. Go for a bike ride: Stop by Resort Services in the Carolina Hotel to check out a bike at no charge. Be sure to ask about trail maps. Click here for details. If biking isn’t your thing, we offer a variety of other activities. @PinehurstResort walk #2 w/ a caddie, NO CART! Order the shortest person at the table the key lime pie, don’t tell them, see who is taller. @PinehurstResort hit fairways.. Do what ever you have to do to find faiways and shoot for middle of greens dont need to be a hero. @PinehurstResort – Play #2 more than once. The first time you are soaking in history, the second time you get to actually play the course. @PinehurstResort Spend some time looking at the exhibits on display in hallway of clubhouse.